Rock Maker 2.9 brings many exciting features to the software, including a new way to navigate images, an in-software set of tutorial, on-demand drop imaging. See all of your capture profiles and inspections in a single glance with Composite View. We’ve added a new view to the Image Navigator to make it easier to find special inspections and capture profiles and to see all of your image, drop, capture profile, and inspection options at once. The view you are familiar with in the navigator is still available and is now referred to as “Thumbnail View”. “Composite View”, shown below, is accessible by clicking a button at the top-right of the Image Navigator. To see images of a specific kind taken during an inspection, simply click the camera button . Learn basic tasks using Rock Maker University. You’ll notice a new button on the toolbar in black and white -- this button is your doorway to Rock Maker University. Rock Maker University will teach you how to perform common tasks in Rock Maker while you do it -- for example, the “Creating a Protein Formulation” tutorial actually walks you through the steps of creating a protein formulation, and at the end of the tutorial you have a protein formulation to use in your experiments. Please note that this release of Rock Maker University is a preview. We will continue to build out the tutorials and tours. If you have ideas for scenarios or parts of Rock Maker that you would like put into this kind of tutorial format, please email hannah@formulatrix.com. Image drops on demand. 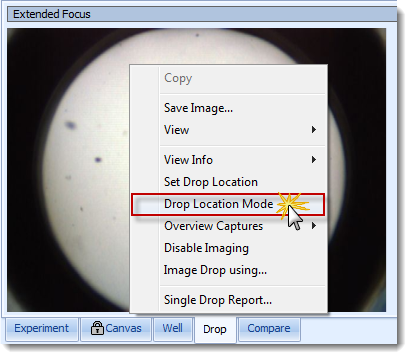 You can now initiate an on-demand imaging session for individual drops directly from the Canvas or from the Drop tab. Simply select the drops, right-click and select "Image Drops Using", then select the desired imaging capture profile(s) and click OK. You can also image plates from the right-click menu on the Explorer. See more exact imaging areas when drawing Regions of Interest. Since there are different imaging parameters for visible, UV, FRAP, and SONICC imaging methods, some of you may have noticed that a region of interest you created on a drop imaged with visible light returns a slightly different length and width when imaged with UV. If you are a customer that uses multiple imaging methods, you will notice that the ROI tool now shows several different colored boxes at once. These represent the actual obtainable area for each imaging type, programmed to your specific imaging capabilities -- if you have fixed zoom options, for example, the boxes you draw will "snap" to different sizes as you attempt to draw the ROI. Customize imaging schedules with a single click of the mouse. If you’re setting up a project or experiment and working on the imaging schedule, you can now customize the schedule without right-clicking. Simply check a box and a message will appear asking you to confirm that you would like to customize the imaging schedule, then continue customizing the schedule. Choose which drops to image by typing in their well locations. You can now control imaging on a drop-by-drop basis with the new "Select well(s) by name" feature. This feature is accessible from the Tools menu, and is also available by right-click. Just type in the well numbers associated with the drops you want to image (separated by commas or spaces) and click OK.
Refresh the Explorer to instantly show changes made by colleagues. The Explorer now includes a refresh function, helpful in workgroup situations. Simply click anywhere on the Explorer, then press F5 on your keyboard. Sample Searches in Search and Filter. In an effort to make Search and Filter easier to use, we have included three sample search and filters for you to use and learn from. You'll notice a new "Sample Searches" sub-folder in the "Searches" folder. Then, choose "Drops vs Ingredients", "Drops vs pH", or "Screens Used in Experiments". Usage Report Option. The Usage Report allows Rock Maker to send a log file containing information about how you use Rock Maker to usability@formulatrix.com. Enabling Usage Statistics will help us determine where the develop features, and when to retire features if they are no longer useful to you. To opt in, go to Setup folder on the Explorer and double-click the "General" node. Then, select the check box next to "Help make Rock Maker better by automatically sending usage statistics to Formulatrix". Drop Location Mode. Drop Location Mode allows you to draw drop location boxes for multiple drops while moving around your plate on the canvas.